It’s possibly the biggest single leak of documents in the history of investigative reporting. This week, the Washington, DC-based International Consortium of Investigative Journalists released a series of stories based on 2.5 million documents that its director, Gerald Ryle, had obtained while he was still doing journalism in Australia. In the last 15 months, 86 journalists in 46 countries have been poring over the document cache. ICIJ, housed in the Center for Public Integrity, coordinated the investigation from DC, using a secure messaging system to communicate with a worldwide team of journalists and free- text retrieval software and programmers in three continents to mine the information from the documents (for more, read this account of how this amazing project was put together). In recent years, there’s been great work done on the offshore economy, including astounding estimates made by economists, advocacy groups, international financial institutions and academics of the trillions of dollars of global wealth that is stashed in offshore havens. What makes the ICIJ’s exposé such a blockbuster, however, is that it names names, in effect puncturing huge holes in the armor of secrecy that makes offshore havens so attractive. 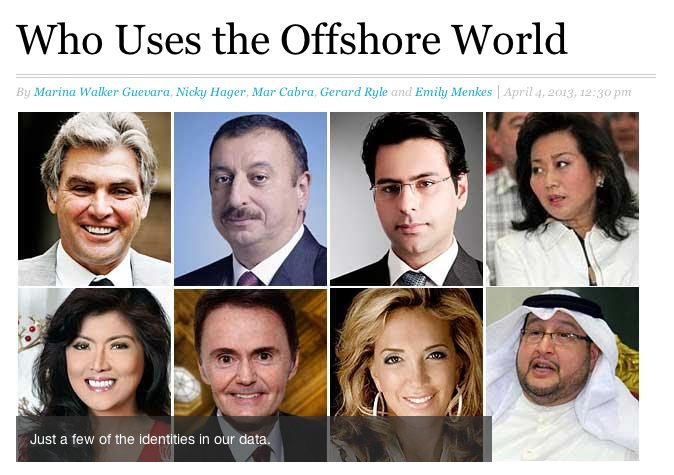 The ICIJ reports this week expose an array of individuals, including politicians (everyone from a Kuwaiti sheikh to Imee Marcos in the Philippines to members of the Azerbaijani ruling family), businessmen, criminals, and even a songwriter and art collector who have stashed their assets overseas. Up till now, those assets – at least those in 120,000 offshore companies and trusts now on ICIJ’s database – were cloaked in secrecy, kept away from the prying eyes of journalists, government regulators and tax collectors. But no longer. Offshore companies are not illegal. There are legitimate reasons for housing a company offshore. But because offshore havens guarantee their clients secrecy, they have become natural havens for corruption, organized crime and tax evasion.